After my successful attempt using hazelnuts to make macarons rather than ground almonds the other week, I decided I would try another nut. Next on the list were cashew nuts – mainly because I had a couple of bags in the cupboard. As well as experimenting with the recipe I was also experimenting with my new camera – for my birthday I treated myself to an SLR camera. I was playing around with all the settings to work out how to use it, so I ended up with loads of photos which are all only very slightly different! So over the next weeks some of the photos might be slightly experimental… But hopefully better than the ones which I’ve been taking on my phone until now! The macarons really did taste of cashew nuts. More than I was expecting. Cashew nuts have a pretty distinct flavour and I was worried that it might get lost in the sweetness of the macarons. 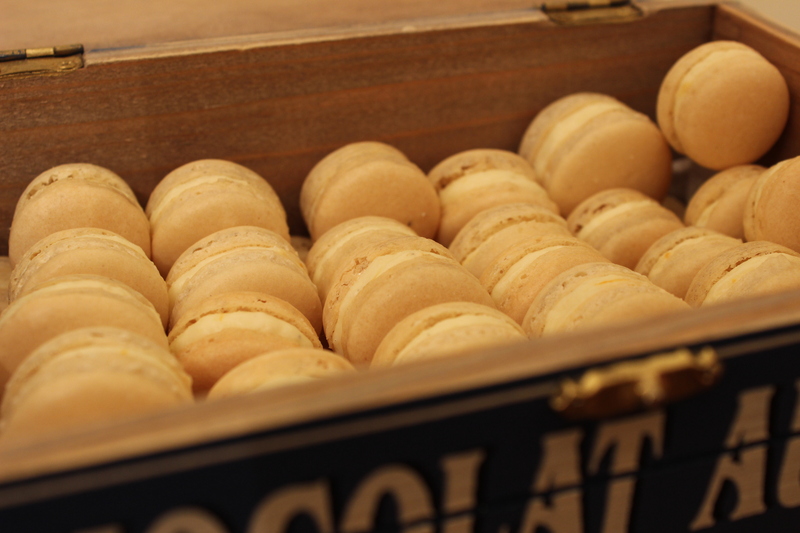 But it didn’t at all and I could have quite happily eaten the macaron shells without any filling. So I decided that they needed a filling that would compliment their flavour and I went with a flavour which I’ve never tried in sweet baking before: cardamom. I’ve only ever used cardamom in curries but I know that it goes well with sweet things. I’ve got a couple of recipes which pair it with white chocolate and orange. I thought white chocolate might be a bit sweet so I went with orange to add a bit of freshness. The only issue I had with them was that some tasted more of orange and some more of cardamom. This was probably because I made them pretty small (they weren’t as even in size as the last lot I made!) so even though I beat the filling really well, some ended up with lots of orange zest in and others with hardly any – maybe orange juice rather than zest might work better. The ones with lots of orange in ended up overpowering the cardamom. But some of them were perfect – you could taste the cashew nut, orange and cardamom. Sift the icing sugar and ground cashew nuts together into a bowl. Place 3 silicon sheets/sheets of baking parchment into 3 baking trays. Put the egg whites and caster sugar into the bowl of a stand mixer with a whisk attachment (or in a bowl and use a hand whisk) and whisk on slow-medium (4 on a KitchenAid) for 3 minutes – it won’t look like much has happened to them. Increase the speed to medium-high (7 on a KitchenAid) for another 3 minutes. Finally, increase the speed one notch (up to 8) for another 4 minutes. Tip the icing sugar and ground cashew nuts into the egg white mixture and stir in – there’s no need to be gentle to start with. After it looks combined, start folding the mixture one stroke at a time. Keep testing the mixture to check it’s the right consistency – it should take about 20 seconds for a ribbon of mixture dropped from the spoon to disappear back into the mixture. Put the mixture into a piping bag with a small plain nozzle attached. Pipe small circles of the mixture onto the baking sheets, about 1-2cm apart. 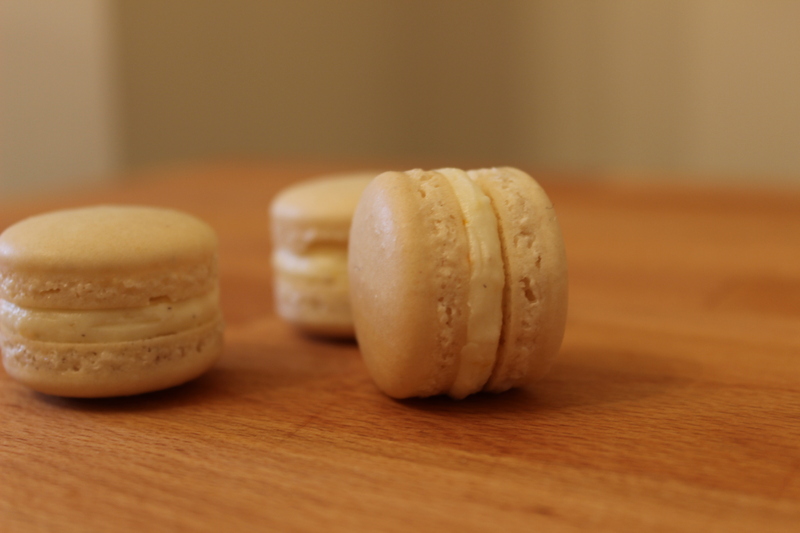 Leave the macarons to form a film for about 45 mins – 1 hour. When you touch them they shouldn’t stick to your finger. Heat the oven to gas mark 1 (130 C/265 F). 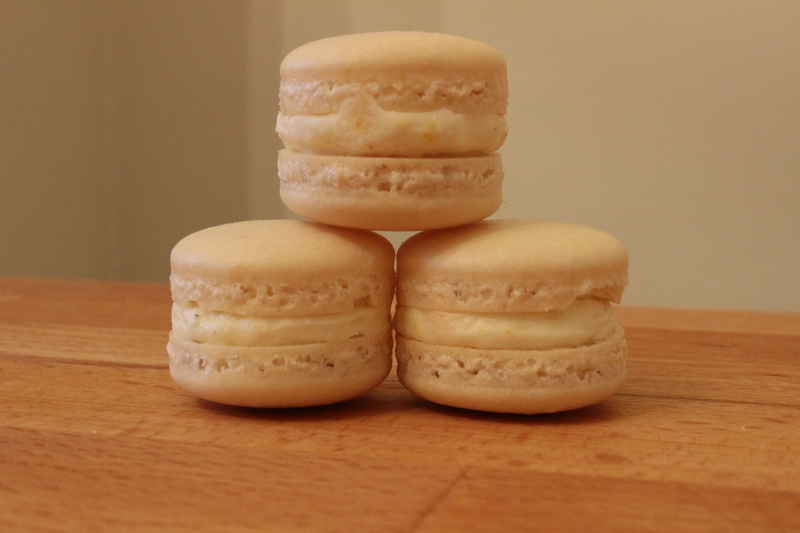 Once the oven has reached the right temperature place the macarons in the oven for 15 minutes. Turn them around and bake for another 5 minutes. Keep checking every 5 minutes – they should come off the baking sheet cleanly. Mine took about 30 minutes in total, but as I mentioned earlier my oven bakes things slowly! Combine the butter and icing sugar together until there are no lumps of butter left. Add the cream cheese and beat on a low speed until combined and then add the orange and cardamom. Beat on medium high for a few minutes until smooth. Place in a piping bag. Pipe a small amount onto one macaron shell and then sandwich together with another shell.